If you are like me, you probably have two types of books on your shelves: some are new, others are second-hand. The two are very different entities: new copies are expensive, pristine and present a current publication; second-hand ones, by contrast, are damaged, may smell of cigars, and potentially present an older edition of the text it holds. Apart from the cigar smell, not much has changed since medieval times. In that era, too, books were bought both new and pre-owned. And like today, their value differed greatly. We know this in part thanks to a rare yet familiar piece of information that is sometimes encountered in a medieval book: the price tag (Fig. 1). The medieval bookseller carefully set a value on the new and second-hand books that he offered for sale. While it is difficult to deduce what factors were precisely in play in this valuation process, availability and looks were probably deemed very important. Manuscripts with illustrations or with a decorated binding may, for example, have been more expensive than plain copies bound in a parchment wrapper. Unlike today, less important was the text’s edition (there were no publishers, editions, or even title pages) or how pristine the copy in question was (it was common for medieval readers to jot down notes, so few copies were truly pristine). Surviving price tags, while rare, add a real-world dynamic to these inferences and assumptions. The tags are usually found on the first page of the book, commonly at the top or bottom so that they could be easily found (Fig. 1). Book owners sometimes added these prices to their book inventories, which therefore provide a great source of information about the value of books – even when the copies themselves no longer exist (Fig. 2). On this page the books owned by Symonis Bozoun are listed (column on the far left) and next to them the price he paid for them (column on the far right). Bozoun (d. 1352) was prior of the Benedictine cathedral priory at Norwich and the page enumerates the books he personally owned. Such lists show that customers valued knowing what they paid for a book, which may also explain why price tags sometimes remain in surviving copies. There are roughly two types of price tag. First there is the plain one, which merely presents a number expressing how much money needed to be forked over in order to own the object (Figs. 1, 3 and 4). The one in Fig. 1 reads “2 s[olidus]” (= shilling) and seems a real bargain. 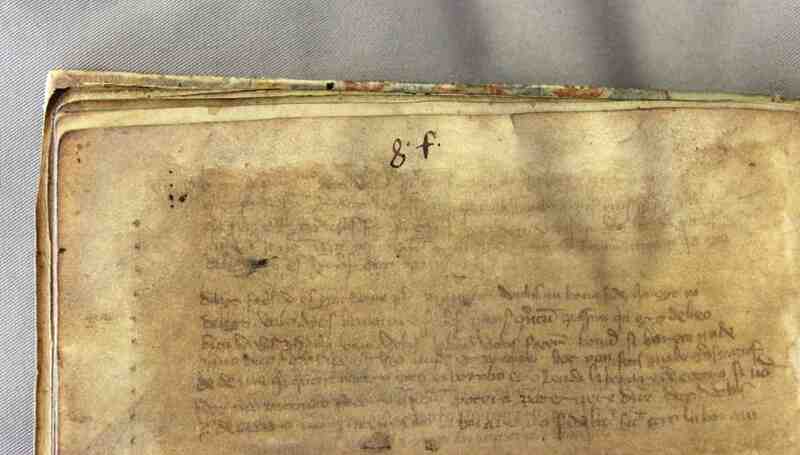 The manuscript in Fig. 3 was sold for “15 s[olidus]” (the note at the top of the page) and was thus considerably more expensive. 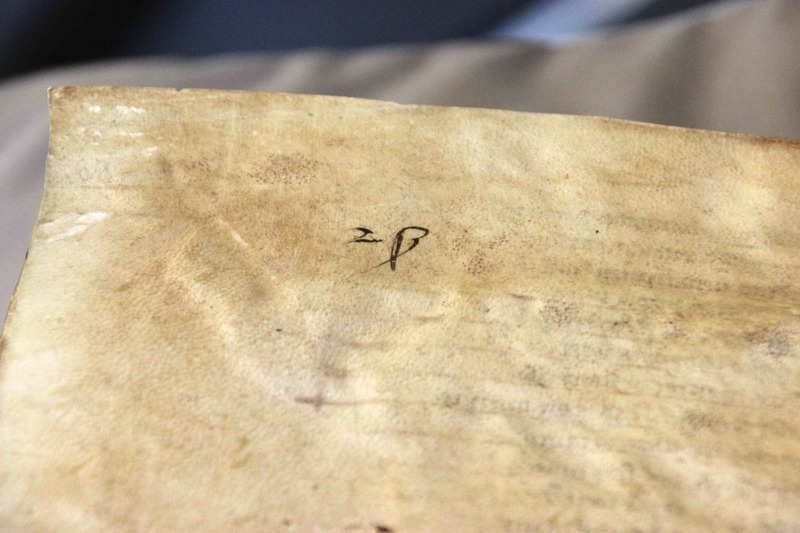 With “8 s[olidus]” the manuscript in Fig. 4 was priced “mid-range”. Such plain tags are almost always found in second-hand copies. That the manuscripts above were sold second-hand can be determined from the handwriting: while the price tags date from the fifteenth century (Figs. 1 and 3) and the sixteenth century (Fig. 4), the books themselves were copied in the twelfth and thirteenth centuries (see the captions). This implies, of course, that the copies were several centuries old when the bookseller put these tags in. It also shows how the texts they contain – Claudianus (Fig. 1), excerpts from Priscian (Fig. 3), and Macrobius’ commentary on The Dream of Scipio (Fig. 4) – remained valuable, even though reading and learning practices had evolved considerably between the books’ production and resale. Pro pergamo 27 quat. precium quaterni iii d. Summa vi s. ix d.
Pro scriptura eorundem viz. xvi d. pro quaterno. Summa xxxvi s.
This “price tag” provides a wealth of information: it shows us how much was paid for the parchment (3 pence per quire, or 6 shilling and 9 pence total), for the copying of the text (16 pence per quire, or 36 shilling total), for the illumination (8 pence) and for the bookbinding (2 shilling). In this case it was the book’s owner who wrote these expenses down, likely to keep track of how much he paid the artisans who executed the different stages of book production. 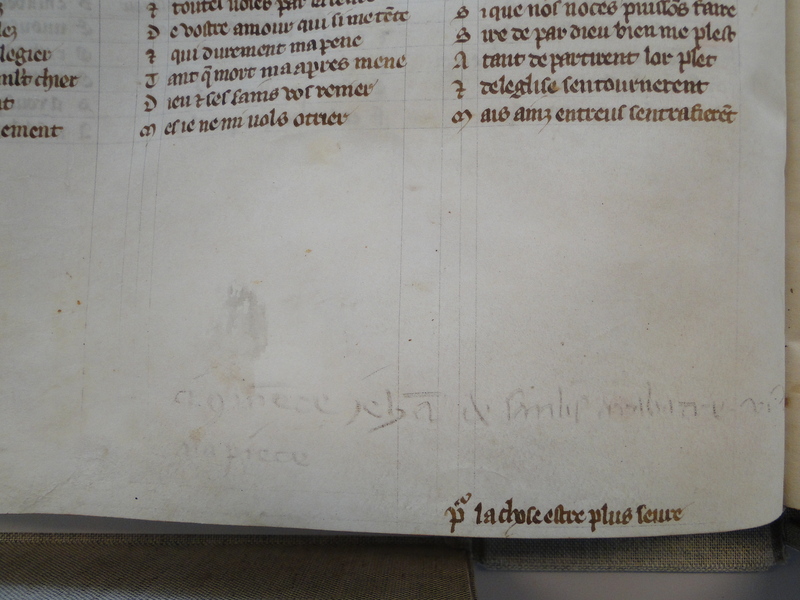 It was more common, however, that such itemised bills were drawn up by the individual who coordinated the book project, a person called “libraire” in medieval French account books and “stationer” in English ones. To provide such tallies, the artisan who copied or decorated had to keep track of how many quires he had already completed. From time to time we encounter penciled notes that helped the artisan do just that. In Fig. 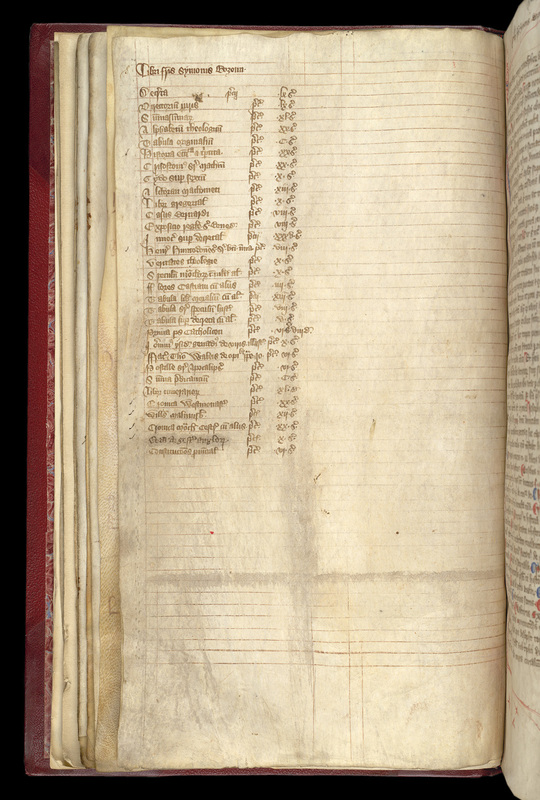 6 we see (faintly) how the professional scribe Jehan de Sanlis jots down how much money he is owed by the libraire (just above the line in ink at the very bottom). As a subcontractor working for different booksellers Jehan had to make sure he got paid for his sweat and tears. 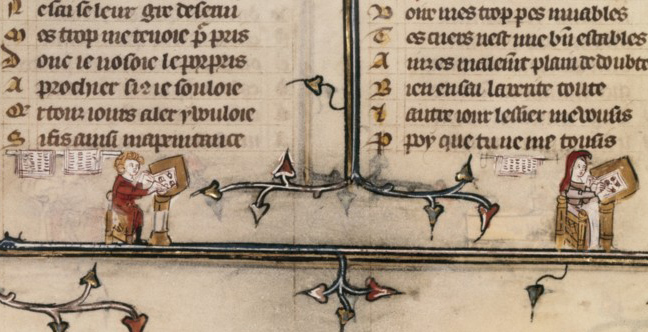 Price tags add considerably to our understanding of the medieval book trade. They not only show how much medieval books differed in price, but we can even relate these differences to specific material and textual features of the books in which they survive. The perhaps most striking thing about medieval price tags, however, is that they allow us to trace second-hand copies and observe how much cheaper they were than new ones – a dimension that remains understudied in current scholarship. Ironically, today these medieval “bargain” books usually fetch enormous sums of money at auction houses (10 million is no exception, see here). 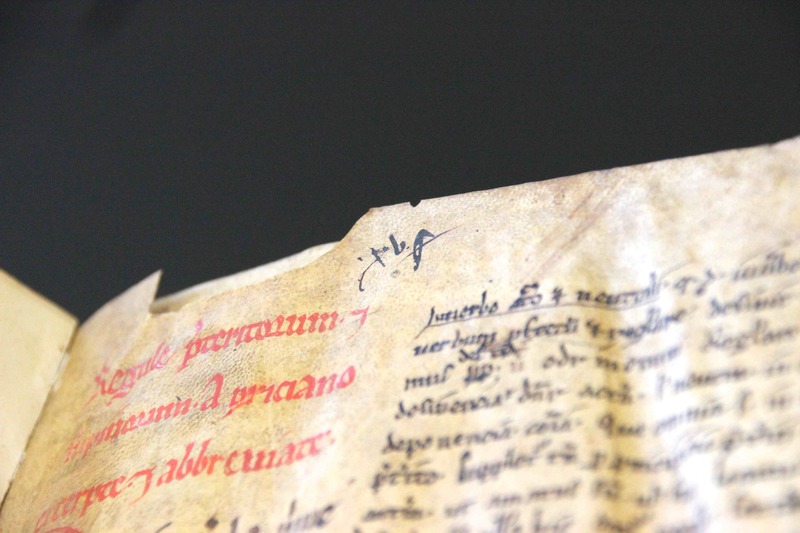 Equally ironic, while in the trade of modern second-hand books older price tags usually devaluate a copy, their presence in medieval manuscripts usually increase their value considerably. Postscriptum – See this blog for more information on commercial book production in medieval times; here you can read about book advertisements and spam. This piece discusses another rare source for book prices, colophons at the end of texts. I traced the price tags in the Leiden manuscripts (Figs. 1, 3 and 4) via Peter Gumbert’s catalogue of the BPL collection (here). More about the medieval book trade in my “Commercial Organisation and Economic Innovation,” in The Production of Books in England, 1350-1530, ed. Alexandra Gillespie and Daniel Wakelin, Cambridge Studies in Palaeography and Codicology, 14 (Cambridge: CUP, 2011), 173-91. Always red letter (gilded letter?) day when your posts arrive. Such marvellous arcane info. Thanks. That’s really nice to hear, thanks! I’d love a bit more detail about how the prices relate to the economics of the time. Was 2 shillings something that a baker could afford? Were the only people buying books rich? How did these prices relate to prevailing wages? That kind of thing. You appear to have a typo. It says “Pro luminacione viii d.” which translates to 8 pence for illumination, but your english text says 6 pence. Good catch, thanks! I changed it. Your query touched on the hard part of this kind of research. A much broader economic study is needed to answer the kind of (good!) questions you ask. Sadly, such studies would need a lot of information that is not easily accessible; and, in many cases, does not even survive, at least not in sufficient numbers. For one thing, you would need to tie the amount written on the page to the precise location of the person who wrote it, because there are great geographical differences (2 solidus in Paris is a different value than 2 solidus in London). That in itself is usually something that cannot be determined. Rarely does the person who wrote down that number also say where he resides. And so the discussion on the value of books remains somewhat obscure. For now.